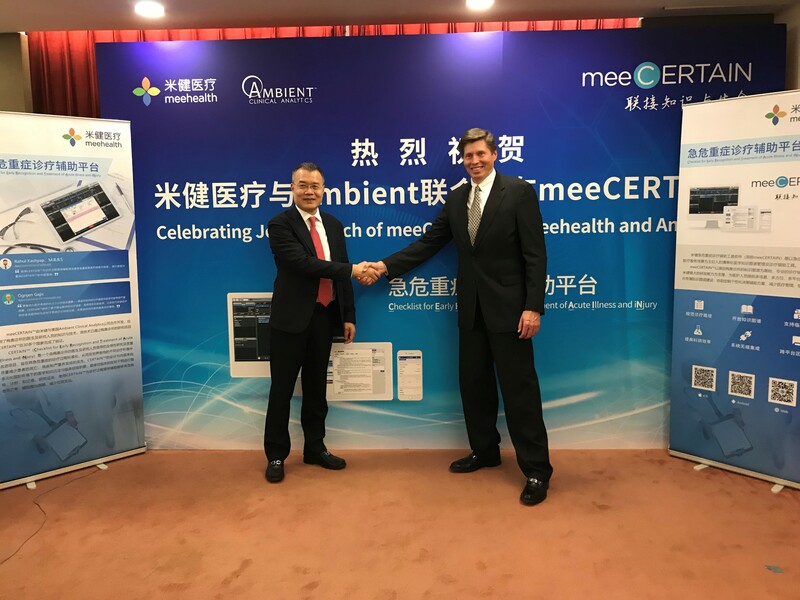 Bringspring Meehealth’s strong support of hospitals across China combined with Ambient Clinical’s products, which are based on Mayo Clinic technologies, make a strong combination to improve healthcare through the use of the advanced clinical capabilities of CERTAIN. Bringspring Meehealth and Ambient Clinical Analytics announced today the launch of CERTAIN, an advanced clinical decision support system with evidence-based diagnostic checklists. CERTAIN (Checklist for Early Recognition and Treatment of Acute Illness and Injury), now available for use in hospitals across China, was developed using technology licensed from Mayo Clinic in collaboration with Ambient Clinical Analytics. CERTAIN technology was tested in 30 countries through a Mayo Clinic research project over the past 5 years. Bringspring Meehealth team worked with Ambient Clinical team to enhance the product, and adapted it to the Chinese medical system’s requirements. This is the first of the new products for China and the world markets from the collaboration agreement signed between Bringspring Meehealth and Ambient Clinical in 2017. “CERTAIN not only assists clinicians in acute and critical care, but also provides a platform for them to share their knowledge and experience, build a medical knowledge graph together and develop professional expertise, which will improve healthcare and eventually benefit more people. That is exactly the mission of Meehealth and also the reason we brought CERTAIN to China.”, Dr. Jiwu Zhang, CEO of Meehealth. “The care assisted by prompting with the checklist and guided practice tool (CERTAIN) will improve the processes and outcome of critically ill patients. 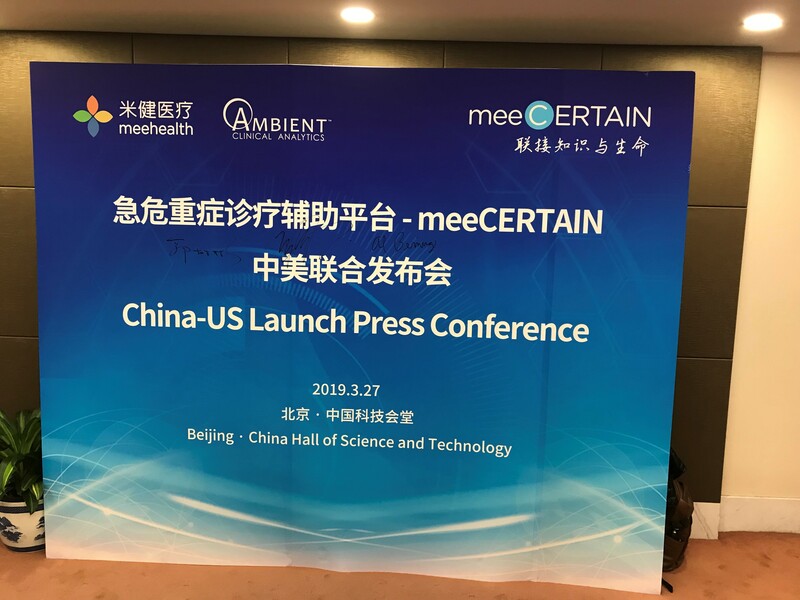 We are excited to see CERTAIN commercially launched in China," said Rahul Kashyap, M.B.B.S., a member of the CERTAIN development team at the Mayo Clinic. Ambient Clinical Analytics was founded by a Mayo Clinic academic clinical team and seasoned technology entrepreneurs. The company has licensed Mayo Clinic technologies which include over 1,000 rules and algorithms to give critical care providers real-time access to vital process-of-care information and analytics at the point-of-care, as well as from a central Clinical Control Tower. Using those technologies, Ambient Clinical commercialized the AWARE - CERTAIN platform and has worked with Bringspring Meehealth to develop CERTAIN product being launched today. The CERTAIN product provides critical clinical resuscitation information in the first “Golden Hours” of critical care. Bedside based alerts for conditions like Sepsis allow physicians and medical personnel to spend more time with patients rather than reviewing data. Ambient Clinical’s products are designed to support a hospital’s Lean Quality and Six Sigma initiatives. Ambient Clinical has achieved FDA Class II Clearance for the AWARE and Sepsis DART software platform. Bringspring (300290) is a technology listed company established in 2005. Driven by ongoing innovative, the company is focused on health data and intelligent cloud services areas, and provides excellent products and services applying cloud computing, big data, IoT, AI and other cutting-edge technologies. With more than ten years efforts, Bringspring is committed to building a better intelligent and healthier world, and has grown into a company with considerable investment value and development potential. In 2017, company jointly launched the China health big data Limited company, led by National Health and Family Planning Commission, to build healthcare big data ecosystem. Ambient Clinical Analytics sells powerful real-time bedside healthcare data assimilation, communication, and analytics based clinical decision support tools that support the general hospital floor, Emergency Department, ICU and other critical care areas. At Ambient Clinical Analytics, we understand the power of data to save lives and our analytics based, real- time, point-of-care solutions like Sepsis DART rely on real-time data to improve Sepsis detection and the monitoring of Sepsis treatment. Our business model is supported by software license fees, SaaS, Cloud and system integration support. Ambient Clinical Analytics has an MD and executive team with strong track records in medicine, clinical research and informatics, medical products and IT. Ambient Clinical’s investors include Social Capital, Mayo Clinic, Waterline Ventures, Bluestem Capital, Noaber Ventures, Rock Health and Rochester Area Economic Development Inc., Additional information about Ambient Clinical Analytics and AWARE indications for use can be found by visiting: https://www.ambientclinical.com.